OXFORD, Miss. – A recent gift to the University of Mississippi established the Mississippi Scottish Rite Literacy Program, which will offer literacy programming for area children, with the potential for statewide outreach. All literacy programming, provided by certified speech-language pathologists and graduate student clinicians from the UM Speech and Hearing Center, will be designed to improve children’s reading skills and make interventions available for children with reading disabilities. The program will provide quality services for children diagnosed with a reading disability and those at risk for learning to read, as well as clinical training for graduate students in the UM Department of Communication Sciences and Disorders, or CSD. This program expands the Mississippi Scottish Rite‘s support of children with language and literacy problems through direct service as well as through educating graduate students who will continue this work in their professional practices. “On behalf of the approximately 2,400 Scottish Rite Masons of Mississippi, it is with great pleasure that we partner with the University of Mississippi to establish a literacy program for children, while enabling student practitioners to hone their skills,” said Bill Sloan, deputy of the Supreme Council for the Mississippi Scottish Rite. “The Scottish Rite Masons work hard to help support the identification of dyslexia and literacy issues with children to improve their learning abilities at the earliest stage as possible,” Sloan said. “This leads to a more positive learning environment, enhancing their perspective and comprehension and bringing about better-prepared young adults and more productive citizens. Ann Michael, who just completed her term as interim chair of the CSD department, initially reached out to the group because of its strong record of supporting language and literacy programs at a state and national level. The Scottish Rite is well-known for its philanthropy with programs that help children achieve their greatest potential, said Sue Hale, CSD alumna and advisory board member and former American Speech-Language-Hearing Association president. 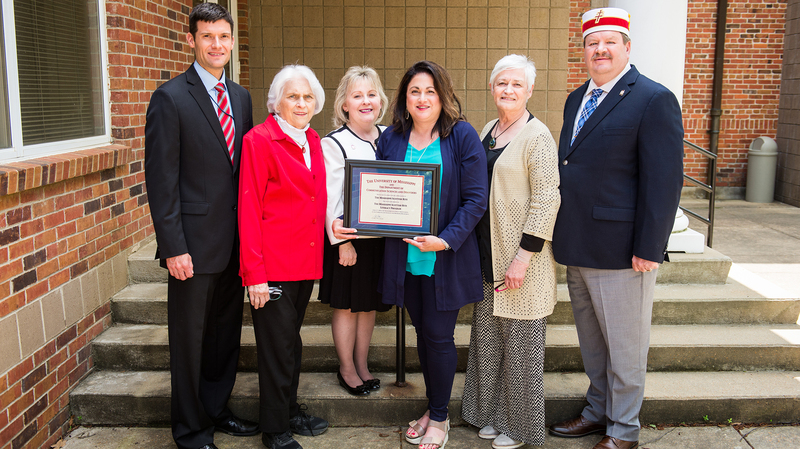 “Scottish Rite has a distinguished history of providing funding to language and literacy programs nationwide, and I am grateful that CSD at Ole Miss will be able to extend its good work through their contribution to this partnership,” Hale said. The Mississippi Scottish Rite Literacy Program will directly address components of UM’s mission by creating, sharing and applying knowledge in a format that trains students to use evidence-based practice to serve the people of Mississippi. The student training and client remediation for this program will be based on the latest research recommendations for reading instruction. Designed to meet the unique characteristics and needs of each child, the remediation will include explicit one-to-one instruction as well as some small-group interactions. Offering comprehensive reading evaluations to identify targets for intervention is a top priority for the CSD department, which operates the Speech and Hearing Center. CSD is also focusing on creating an after-school literacy program, preventive programs in collaboration with local schools and summer literacy camps. “We are incredibly grateful for this gift from the Mississippi Scottish Rite, because it allows us to provide a critical service to children and a clinical opportunity for our graduate students to expand their practical experience and research,” said Teresa Carithers, interim dean of the School of Applied Sciences. For more information about the Mississippi Scottish Rite Literacy Program, call 662-915-7652. To contribute to the program, send a check with the initiative’s name noted in the memo line to the University of Mississippi Foundation, 406 University Ave., Oxford, MS 38655; or visit http://www.umfoundation.com/makeagift.